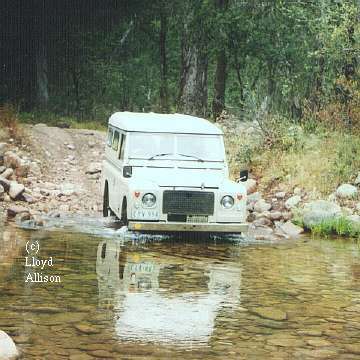 1979: The LandRover stage-1 is so-called because it was the result of stage-1 of a major investment plan at LandRover which eventually led to the 90 - 110, later `Defender' range. The stage-1 is a Series III leaf-sprung 109" LandRover with the 3.5-litre petrol V8 and 4-speed full-time 4WD transmission out of the early Range Rover and 101. 1981: An Isuzu 4BD1 3.9-litre 4-cylinder diesel engine was a factory fitted option in Australia. The series III chassis was modified by moving the grille, radiator and first cross-member forward, deleting cross-member number two, making the cross-member under the gearbox removable, and cuting away the cross-member behind the transmission to clear the prop. shaft. Axles are standard series III but with 3.54:1 differentials and with Range Rover style constant velocity joints in the steering swivels, on account of the constant four wheel drive.